THE 4 ALZHEIMER’S DISEASE MYTHS YOU CAN FORGET! You can’t diagnose Alzheimer’s disease. There’s no way to reduce your risk of Alzheimer’s disease. A must-read new report from Icahn School of Medicine at Mount Sinai clears away the confusion surrounding the age-related disease every adult fears. Today more than four-and-a-half million Americans suffer from Alzheimer’s disease and as the number has grown, so have the misconceptions and fears. Now, a new report from Mount Sinai’s Focus on Healthy Aging dispels the myths and gives you hope-and-guidance-filled news for minimizing Alzheimer’s disease’s effects upon your life or a loved ones. Alzheimer’s disease is NOT a direct genetic disease. THE FACT IS: Genetics alone are not responsible for most cases. Some environmental factor or factors must also be involved. This means that there are agents which once identified can be controlled. You CAN diagnose Alzheimer’s disease. THE FACT IS: Doctors now have tests and tools that can be up to 90% certain in a diagnosis of Alzheimer’s disease. And new diagnostic tools are making earlier detection a practical reality. Medications DO work. THE FACT IS: No medication can reverse Alzheimer’s disease but new drugs and combination therapies can slow its advance. And new studies are showing that some medications you already take may be adding to your body’s defenses. There ARE ways to prevent Alzheimer’s disease. THE FACT IS: New findings about diet, exercise, lifestyle, and medication are showing it is possible to reduce your risk— dramatically—and permanently. This is a report that will get you thinking—and acting—the moment you open the first page. The Report takes today’s research and distills it into practical recommendations you can apply to your daily living to build mental resiliency and increase your brain’s resistance to Alzheimer’s disease and other forms of age-related dementia. Get the authoritative 2019 report Alzheimer's Disease from Icahn School of Medicine at Mount Sinai. Prevention is possible. Discover the preventive strategies that make sense! You will gather an important understanding of the mechanics of your mind. Alzheimer’s disease strikes one in eight men and women aged 65-85. It is the most common form of dementia in America. But why are some seniors singled out and others spared? What defining physical changes occur in the brain when Alzheimer’s disease strikes? Why is short-term memory the mental function first affected? Why does the ability to understand outlast the ability to speak? The Report will show you how your mind works. You’ll learn about the brain’s natural resiliency and tips to foster its continued health. You’ll see how doctors are unraveling the mysteries of the disease’s distinguishing tangles and plaques. You’ll even learn about the links between diabetes and dementia. You’ll explore different types of memory and techniques to compensate for loss. You’ll find out how to anticipate and curb agitation and anxieties…why patients remember how to use a tool well after they have forgotten what the item is called…and how cognitive rehabilitation techniques can help patients retain greater self-esteem and independence. You’ll discover the preventive strategies that make sense! As we said, the good news is that prevention is possible; you can lower your risk of Alzheimer’s disease and maintain a healthy brain longer. The 2019 Report will direct you to those measures that matter. You will see how a “heart healthy” lifestyle can decrease your vulnerability to Alzheimer’s disease. You’ll learn which fish are the best brain food…which cholesterol medication may be a “magic pill” in reducing your risk for contracting Alzheimer’s…and why a walk with a friend might just be the smartest step you take. Plus, The Report will give you a look at the remarkable progress physicians and researchers are making in stemming the disease’s effects and causes. You’ll read about… a newly-isolated “biomarker” that may provide an easily-read warning sign…a newly discovered gene that may lower your risk…and a new “energy shake” to feed starved brain cells. You’ll get the guidance you need to be an effective caregiver. When a parent or spouse is struck by Alzheimer’s disease, you are called upon to be a helping hand and a familiar face…a protector and a provider…an advocate and an administrator. The 2019 Report will prepare you to assume these duties with an understanding of both the patient’s needs and your own. You will find online resources to help determine when to take away the car keys…for creating memory and reminiscence aids…for reducing wandering…for selecting an assisted care facility or nursing home…and for managing important legal, financial, and health care matters. Learn the latest news and developments on Alzheimer’s disease by ordering the 2019 Edition immediately! 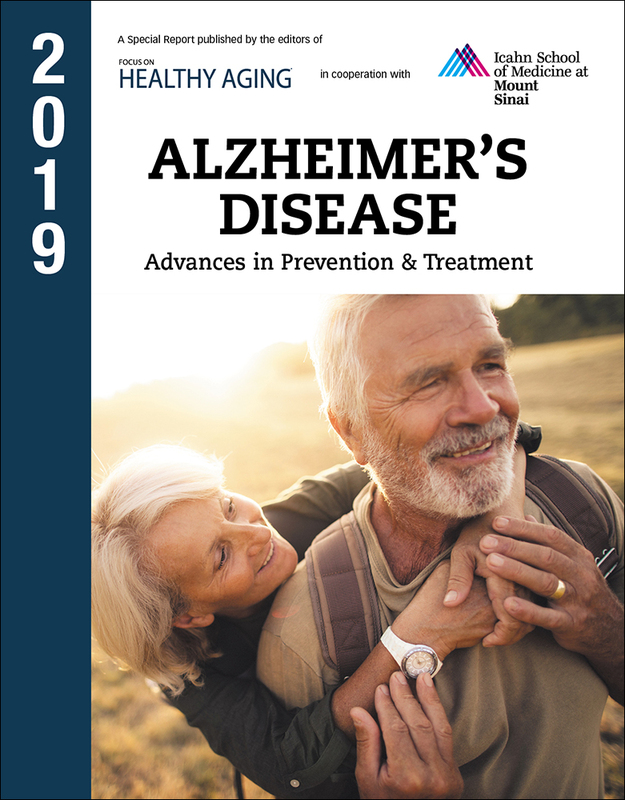 Alzheimer’s Disease: The 2019 Report is ready now at the lowest price you’ll find anywhere. At any amount, it’s a very small price for such instructive medical guidance and the invaluable clarity it brings to a subject that affects us all. There’s no reason to wait! This printing of Alzheimer’s Disease: The 2019 Report is limited. To avoid any delay, order today! And to ensure that you stay on top of important findings as doctors and researchers continue to study the brain, memory and the various forms of dementia, we will reserve future annual editions for you on a priority basis and at our lowest price. We will notify you by postcard or email before the next edition is released and shipped to you. If you don’t wish to receive it, just return the card within 30 days. You will also be able to review each future issue before deciding to keep it.